Ezariah, whose real name was Julie Albright, passed away today. It's been awhile since she posted here, but she was always so sweet and enthusiastic. We remained in contact through Facebook, and it was there today that I read the shocking news. She was far too young and had far too much going for her to have to leave so soon. I know many of you remember Ez or know Julie though FB or other social media, and I wanted to pay my sincerest condolences to her family and friends. Admin wrote: Ezariah, whose real name was Julie Albright, passed away today. It's been awhile since she posted here, but she was always so sweet and enthusiastic. We remained in contact through Facebook, and it was there today that I read the shocking news. She was far too young and had far too much going for her to have to leave so soon. Thanks for this, Victoria. I didn't think to post anything here. Julie's an amazing and beautiful woman, one of the most caring and giving people I've ever known. Everyone in her large circle of family and friends are heartbroken and will miss her terribly. It was always so much fun to get together with Julie, whether for racing or to do touristy things or to just hang out, she made everything fun and exciting. This is all so very sad and will take awhile to process. Rest in everlasting peace, dear Julie. You were well loved by those whose lives you touched, people and critters alike. Julie was great and anything I could say about her would not be enough. This is so horrible. I haven't stopped thinking about it all night. I never even met her in person, but thought so highly of her, she seemed like such a good and kind spirit. I hope that she's at peace, and that those who loved her find some kind of peace as well. Thanks V for letting us know that Ezariah had passed. Admin wrote: I haven't stopped thinking about it all night. I never even met her in person, but thought so highly of her, she seemed like such a good and kind spirit. I hope that she's at peace, and that those who loved her find some kind of peace as well. She really was all those things. When Maria's Mon died, she called the farm and got them to send me some of his mane and a shoe. That's the kind of person she was. I hope that you're ok. I will be. I think what's hard is how it went down. That's the worst. I must have joined after she backed off from posting here, as I'm not familiar with her handle. But I guess that was my loss, since it sounds like she was a wonderful presence on this forum. My sympathies to those who knew her. Oh my goodness This is so very sad. My condolences to her family and friends. RIP Julie, you left this world a better place for having shared it with us. Terribly sorry to hear this, she was always such a kind presence on this forum. Thoughts are with her friends and family. That is sad, may she and her family know peace. Omg how awful, I remember her posts? Was she ill? She wasn't that much younger than me horrible news. My best wishes go out to all her family and friends. Losing a loved one is always hard. Very sad. May she RIP. V - do you know if there was a donation set up in her name at all? I know she was supportive of many causes. If not, I'll donate in her name to something of my choosing. 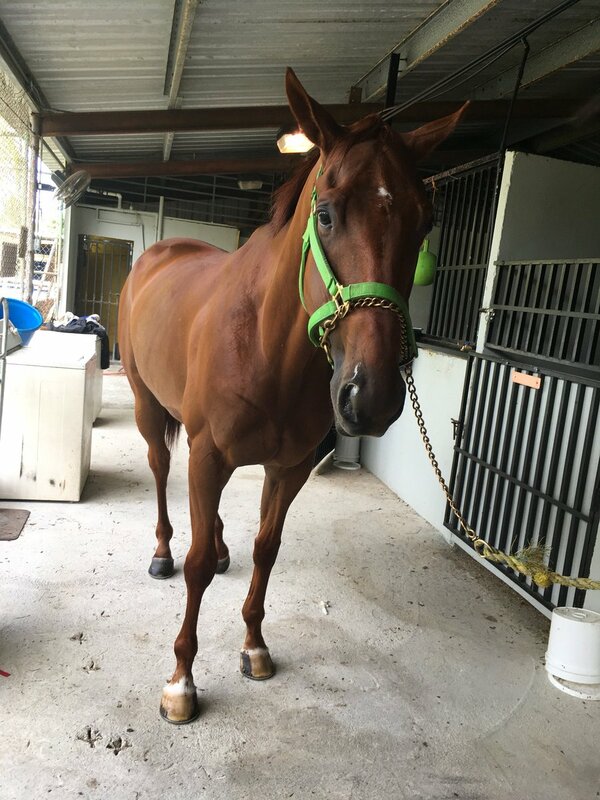 The family is suggesting donations be given in Julie's honor to the retired racehorse farms that she often visited. Those are in Southern California, but I think Julz would be happy to support any good OTTB retirement group. I didn't know her but I'm sorry to hear of her passing. There's been too much loss lately, both personally or people I know and more globally... I hope that she can live on through those who knew her. Sad news indeed. RIP Ezariah. Julie was a regular poster in the Handicapping Forum while I was the Moderator. She was a knowledgeable handicapper and a heartfelt fan of thoroughbred racing!! Her love for the sport and the horses that ran was evident in her posts. Prayers for her and her family and friends. God bless!! I am walking on air today! Julie was a partner in this guy when he first started racing for West Point. He ended up in Camarero, and his last race was Aug 20. We were so worried about him, and that only escalated after the storms hit Puerto Rico. It feels like Julie worked with the angels to make sure this happened. Good job, Julz! Thank you to CTA and to West Point, my faith in you has been restored. CTA has Go Black Tie, former @westpointtbred, on our Watch for many months. They contacted us 2 help retire him when able. Pic from May.